May 8th is National Animal Disaster Preparedness Day. 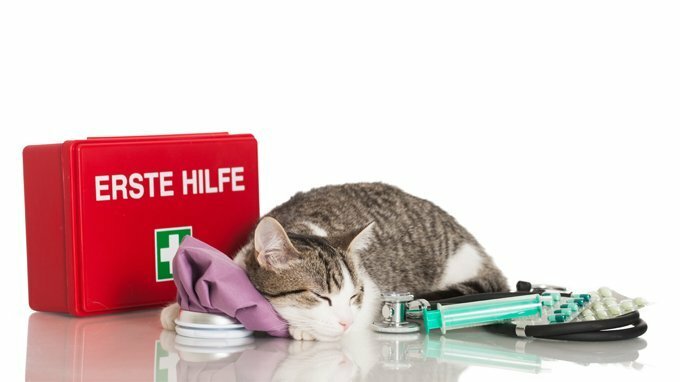 If you are in the unfortunate circumstance of being in a critical emergency, where you have to grab your cat and your keys and rush to the vet, you are going to want all of this information in one place. Preferably a nice envelope that you can grab and go with. Frantically Googling the nearest Animal Emergency Center in the middle of an emergency is the wrong time to be doing that. Even better, plug some of this information into your phone and be sure to print it out in the event that your power, cell or Internet service has gone out. If you have to leave the house in a hurry with your cat, you’re going to need somewhere for them to take care of their business. Portable litter boxes are a must have for any pinch or travel situation. Naturally, you will need kitty litter as well. Grab a small bag of your cat’s favorite litter and keep it in your emergency kit just incase. If you find yourself in an extreme emergency where you need to evacuate your home, you’ll need a good cat carrier. You will want a carrier that your cat will be comfortable in for a few days if necessary. Something solid and sturdy, with a nice handle or strap that makes it easy to carry or throw over your shoulder. You may not walk your cat outside on a leash normally, but if you are displaced for any reason, and don’t have a secure area to let your cat out of the carrier, your cat is going to need some freedom to move around and a cat leash and harness is a great way to give your cat freedom and safety. Anyone with pets needs to have at least one collapsible food dish for travel. They fold up flat as a pancake and yet can hold plenty of water or food. Make sure you let them dry out thoroughly before storing them again or you could end up with mold. It seems like these things should go without saying, but sometimes the most obvious things are the ones we forget. Be sure to keep a minimum of a 3-day supply of food and water for each cat you live with. Make sure it’s the same food they normally eat so you don’t upset their stomach and replace the food and water in your emergency kit every year to keep it fresh. Talk to your vet about keeping an extra stash of any medications your cat needs for your emergency kit. If you’re on a road trip and something goes wrong or you lose your medications, you’ll have a backup supply ready to go. It’s important to observe the expiration dates on these medications and keep them up-to-date. If there’s an emergency and you have to evacuate your home, you’ll be glad these are in your emergency go kit. Cats can scratch when they are stressed out so you will want to make sure to keep those nails trip for the length of the crisis. It’s just a smart thing to do. This is the essential stuff that you’ll need in any emergency kit or go bag. Cuts, scrapes, scratches, bites…whatever may happen, you’ll want to be able to keep injuries clean and treat them so they don’t get infected. With rags and scissors you can cut strips to make a splint, with gauge and bandages you can keep wounds clean. Do you already have an emergency go bag for your cat? Do you think you’re willing to make one after reading this? Anything we missed? What would you add to the kit? Let us know in the comments below.